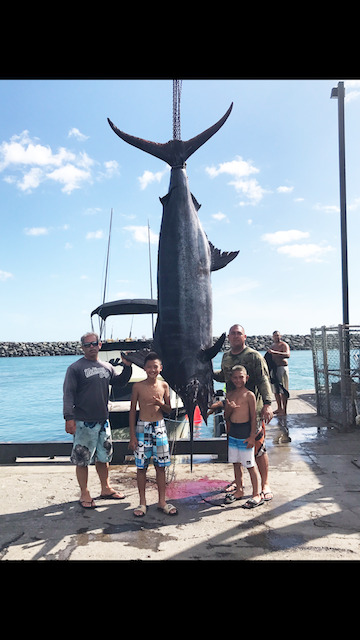 On 7/29/17 this 1032-lb pacific blue marlin was caught outside Waianae on board the KALEI-PUA. Captain Mel Makinney and crew members Lono Makinney, Coen Makinney and his buddy Pookela were on board for the catch. They fought this giant for 3 1/2 hours and had to tow her in to the harbor. They also caught an ahi and a couple mahi-mahi . Awesome catch along with an awesome crew on board an awesome boat!